You must notify us within 10 working days of receiving your item(s) if you are not completely satisfied with your purchase for any reason. We will accept returns for unwanted goods and issue a full refund (minus return postage cost) providing they are received by us in their original condition and packaging. 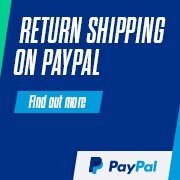 If you made your purchase via paypal, then you can send it back to us and PayPal will refund your return shipping cost. You must activate this free service to enable refunds. Applies to eligible Paypal account holders only and T’s & C’s apply. If an item is faulty, then we are happy to provide a full refund including return delivery costs once we receive the faulty item back with us. We would strongly urge that you use a tracking delivery service such as Royal Mail recorded delivery or another alternative trackable method to avoid any discrepancies, as we can only issue refunds on goods that are received by us. Parcels can and do go missing in the post, so it is important you use a trackable postage method so that you are allocated a tracking number for your parcel and have proof of postage should anything go wrong. Refunds can take up to 10 working days to be processed and reach your account once they are issued by us.